Early fall is full of vibrant colors. We all enjoy Jack Frost's antics and t's enough to almost overwhelm this artist! It's my favorite time of year!! after surgery to remove some old hardware. - I was finally allowed stop wearing the boot and I am sharing a a picture that I took looking down at the contraption! How very pleasant it is to have my still tender footsie where I can wiggle my toes with ease. This is cause for celebration! Still have to keep my foot elevated, and am sternly instructed to "Take it easy!" Difficult for me - who always like to move from one project to another. I've almost finished a small watercolor of a barn, and checked it now in the "light of day". It needs a zing of bright color somewhere vaguely near its center. Hot pink or orange would do the trick.Maybe even a suggestion of some old dried berries on stalks woodwork.. Kind of like "trimming" a hat or getting dressed up and deciding what, if amy, jewelry to wear. Always a bit less that you first think! I like to try out little accents on small pieces of watercolor paper - and test by placing them on the almost finished painting to see how they work, Artistic license! I'll decide, finish the painting and try to photograph it and show it to you on the next blog! LIFE IS ONE CHALLENGE AFTER ANOTHER ! Just over 2 weeks ago, I had surgery on my ankle - removal of some hardware put in over 30 years ago to hold my ankle together. To my dismay, some of the hardware decided to push through the skin - a health "no-no"! 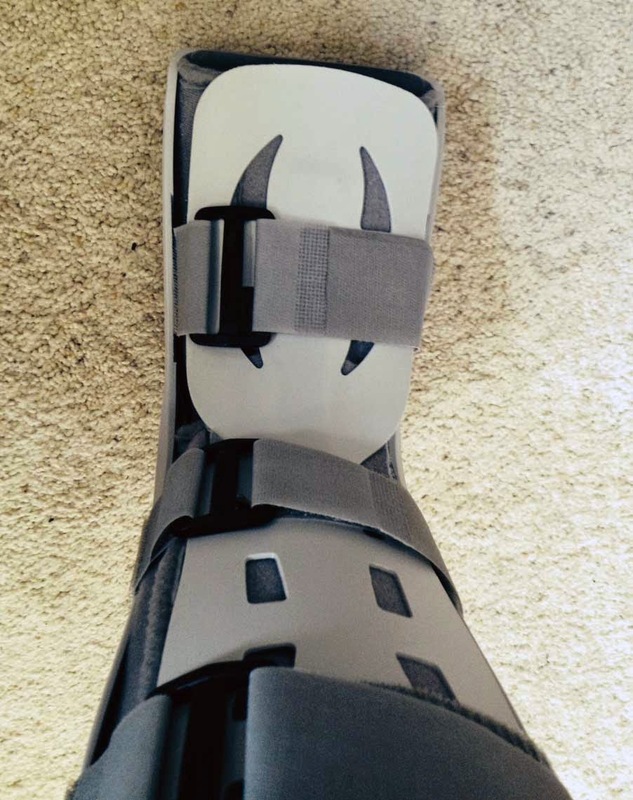 My protective husband bandaged it almost each day for months while we waited for an appointment with my orthopedic surgeon - now it is fixed, and I am lumbering around with a "Boot" a contraption invented to protect the foot beneath. It protects the healing wound after the surgery, and the welcome news is that with very good medical care, I am gradually emerging from one more challenge, and am plugging away on paintings "in process", and have recently finished putting together more popular prints to beef up our inventory. I remind you that our winter gallery hours are 11 till 5 on Saturdays, and by chance (when you see our open sign out), or appointment when you call us. I'm still not adept at getting messages off the I Phone, so safer to call us at our home phone 574-842-4350, where we have a very reliable answering service. Fall is truly my favorite season. After our evening meal - whether at home, or in one of our favorite eateries, Ward drives and I ride along enjoying the scenery, and casing the area for interesting subject matter. We have our good camera with interchangeable lenses, etc. and then we also have an I-Phone, also with photo capability - I'm going to try this - as we try to keep up some with new technology. We do not have "spell check" on this blog setup, so please excuse me if I goof on spelling. Ward takes me to the library every few weeks, where I check out books on CD's - and I listen when I am doing repetitive things , so this listening does not reinforce spelling as well as "reading" from the printed word. Today, I finished hearing "The Daring Ladies of Lowell" by Kate Alcott. an exciting mystery about life for residents and cotton mill workers in a New England town - setting is around 1830. A good "listen" my substitute for a good "read".